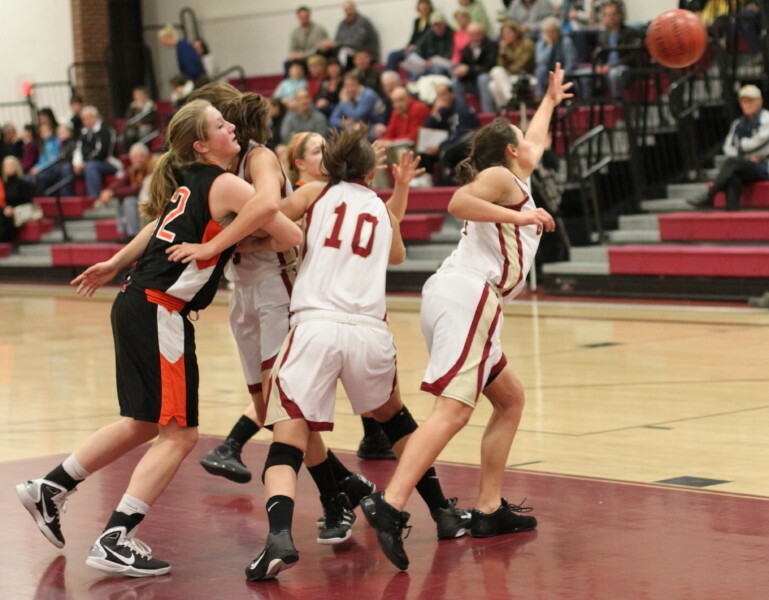 Molly Rowe (24 points) dribbles past Caroline Soucy. 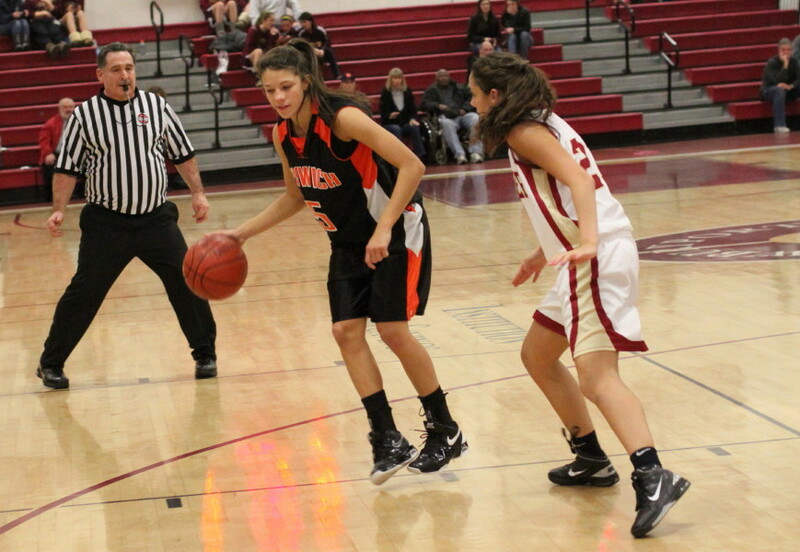 Beth Castantini (15 points) hit two free throws with twelve seconds left. 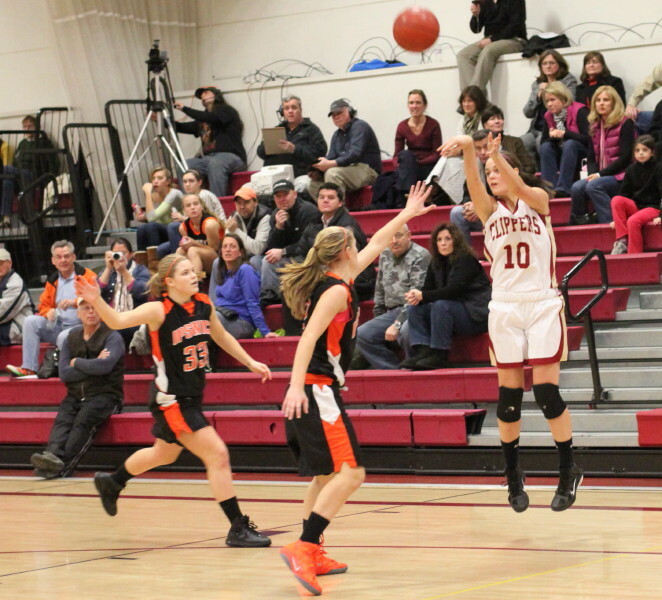 (Newburyport) The Newburyport girls surprised a whole bunch of folks as they upset Ipswich, 55-53, Friday night at NHS in Cape Ann League action. Molly Rowe led the way for the Clippers (5-3) with twenty-four points including eleven straight free throws after missing her first two attempts. Eight days ago, same place, same teams, Ipswich (6-1) had won easily, 46-27. A rematch seemed like a good opportunity for the Tigers to stretch their unbeaten streak to seven and the Clippers looked willing to do their part as they got down by ten early in the second quarter (16-6). What happened next was unexpected. Instead of fading further away, the Clippers ran twelve unanswered points over the next four minutes to take a shocking, 18-16, lead with 2:42 left in the second period. 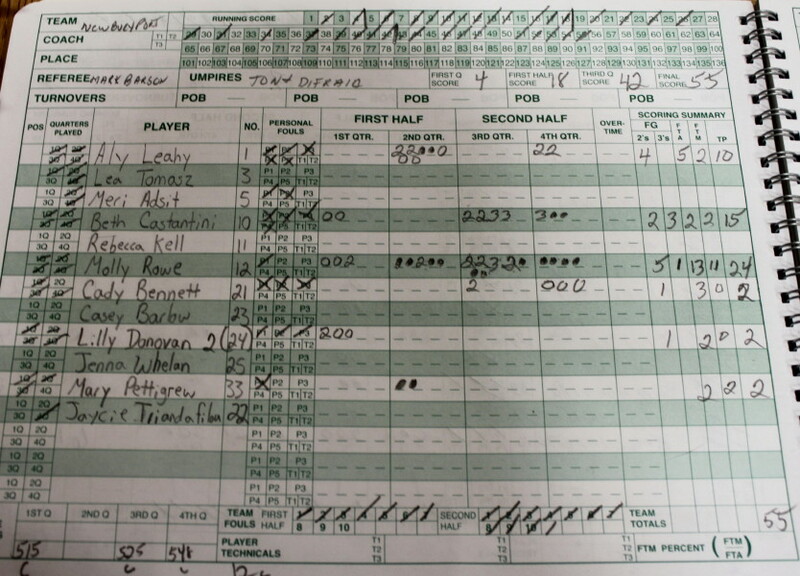 Aly Leahy had a layup and Molly Rowe hit a jumper but the rest of the points were on 8-for-8 foul shooting. 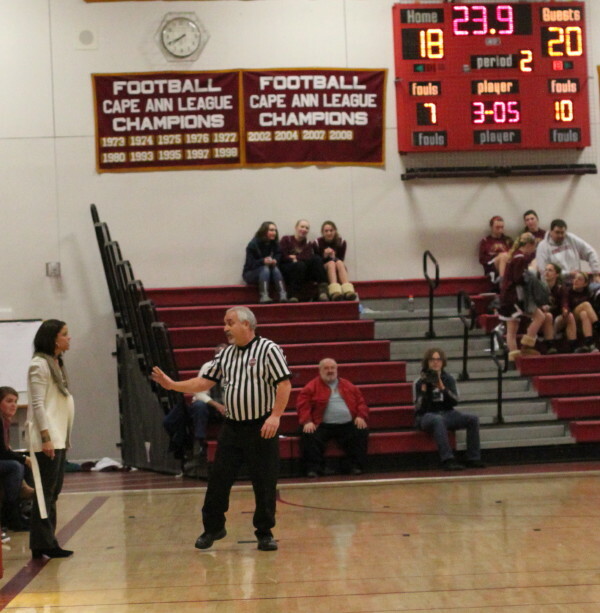 The next ten minutes were entertaining, back-and-forth action, with eight lead changes, until Newburyport took the lead for good, 42-41, on two Molly Rowe free throws with thirty seconds left in the third quarter. 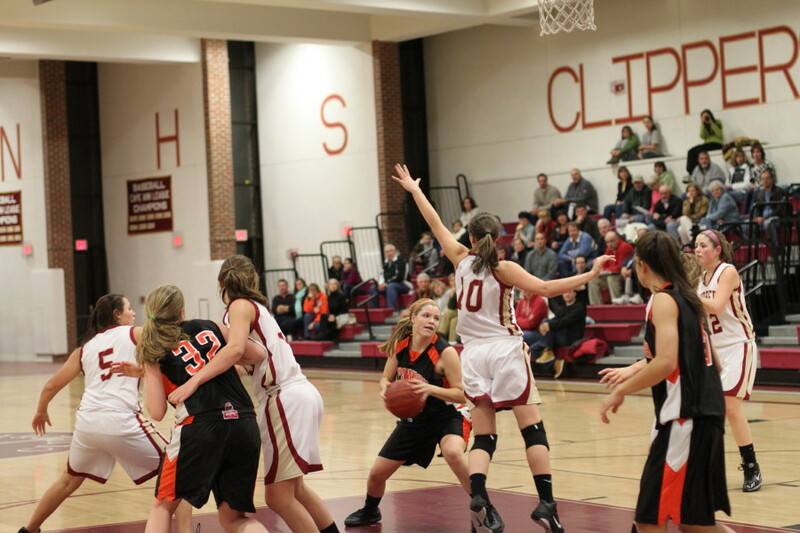 The Clippers extended that lead to five (51-46) on a daring three by Beth Castantini (15 points) with 1:24 left. Game over? Not quite! With defender Mary Pettigrew sidelined, Julia Davis (11 points) notched a layup and thirty seconds later Brigid O’Flynn (10 points) did the same thing. Now that Newburyport lead was only, 51-50, with plenty of time (twenty-eight seconds) left. 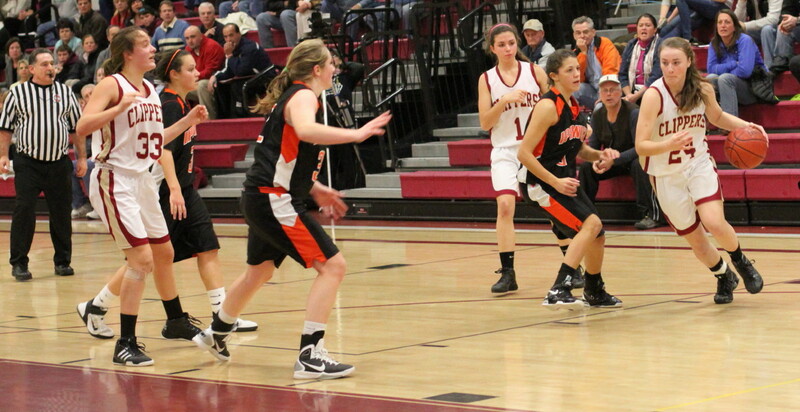 Julia Davis (32) layup late in the game. If you want to pinpoint where the Clippers won this game, it was at the foul line the rest of the way. Molly Rowe got the first chance with 26 seconds left shooting one-and-one. How large were these when you’re only ahead by one? She makes both. Aly Leahy then fouls out fouling Shannon McFayden. 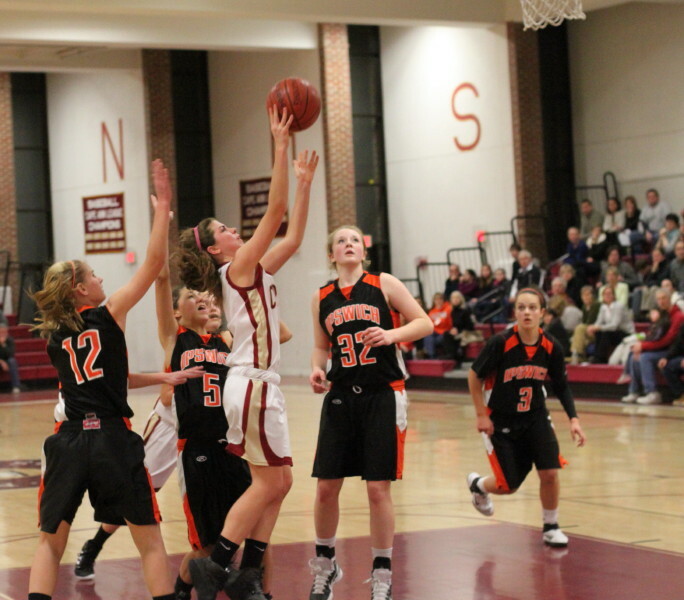 Shannon makes one of two – Newburyport 53-Ipswich 51 with nineteen seconds left. Now it’s Beth Castantini’s turn to face the pressure with twelve seconds left, shooting one-and-one. She makes both. 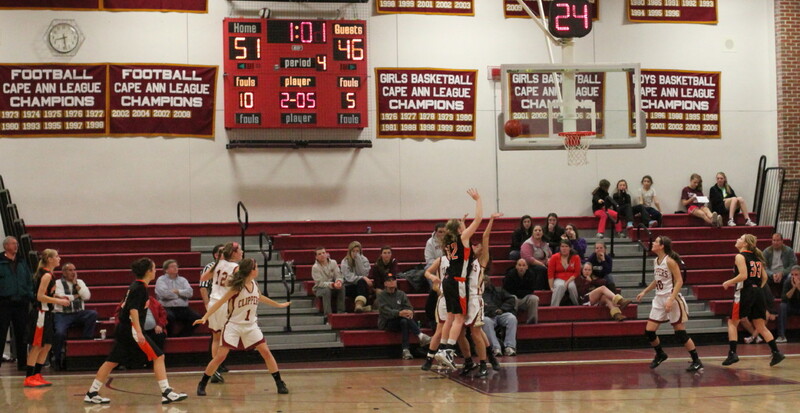 Brigid O’Flynn puts in a layup for Ipswich at the buzzer to close out the scoring. This was clearly one of those games where you never had a clear sense of how it would end up………….until it ended up. 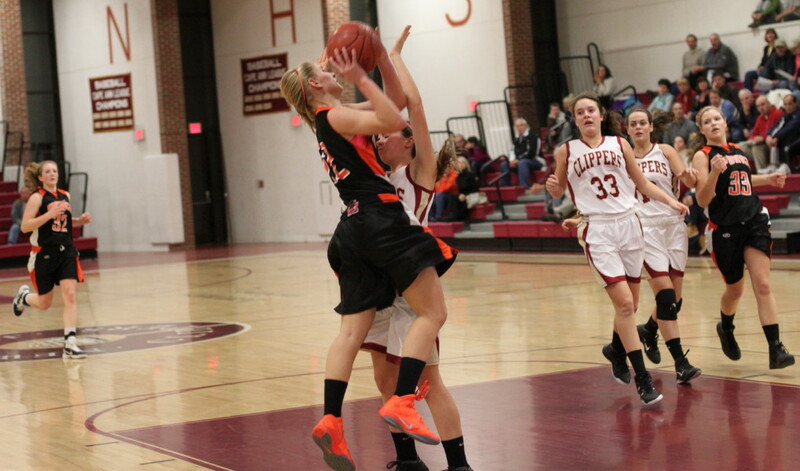 Credit Newburyport’s Mary Pettigrew for limiting the inside for the Tigers’ Julia Davis (11 points) and forcing the Tigers to launch long ones. Ipswich made five from out there but I’m guessing they took at least twenty 3’s, if not more. Aly Leahy (10 points) and Masey Zegarowski (10 points) were the best matchup to watch on both ends of the court – athletic, tireless, and adept at getting the ball into the front court. 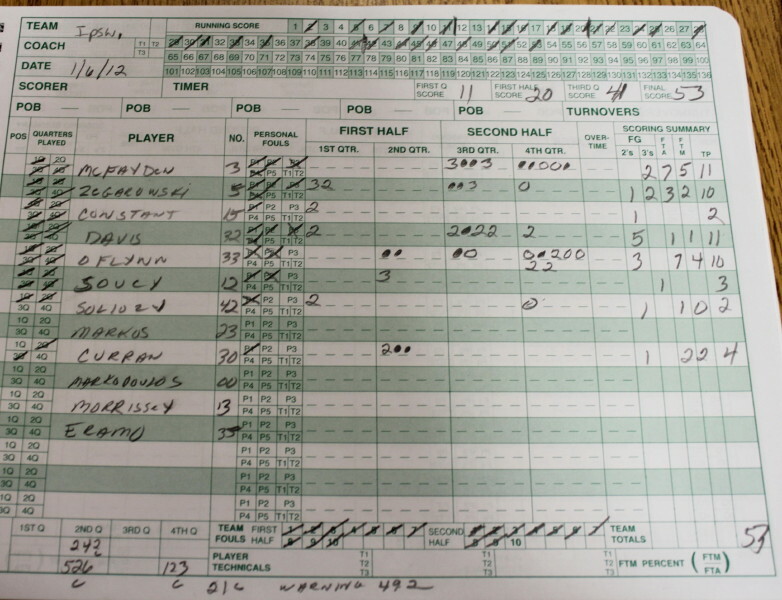 This was a game with very few turnovers and many missed shots. 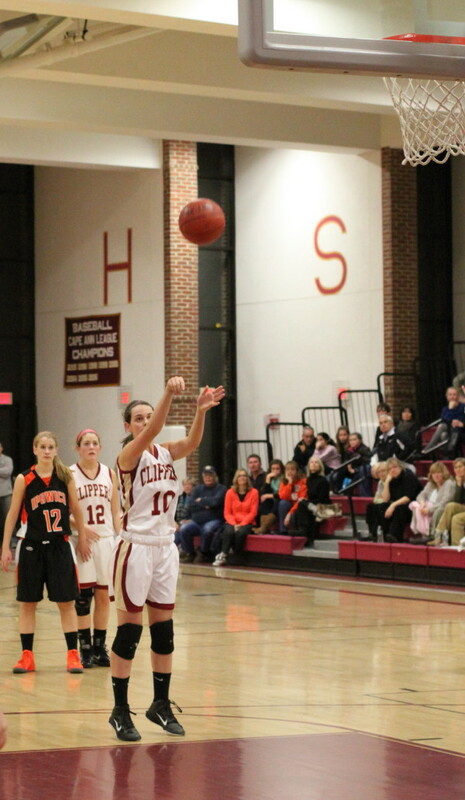 The shooting exception was in the second period when Newburyport tallied 24 points and Ipswich 21. There was game-long whining from both sidelines and stands. You know how partisan the complaining is when every call results in a noticeable negative reaction from one side or the other. No question there were plenty of foul calls and foul shots. 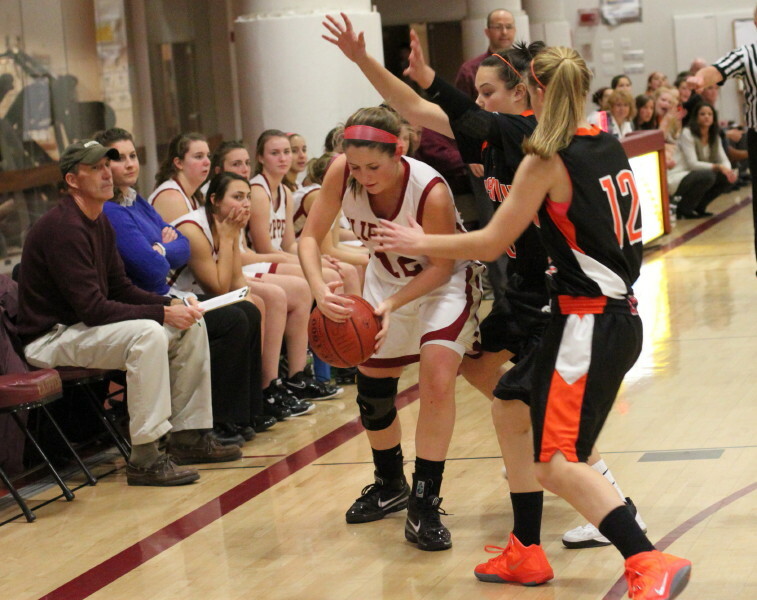 Newburyport missed ten free throws but made four straight in the final twenty-six seconds. Newburyport next plays Lynnfield at home on Monday (7PM). Ipswich is at Triton on the same night (6:30PM).